MedPLUS Connect is a global health organization that was founded by three University of North Carolina (USA) graduates, Emma Lawrence, Emily Nix, and Lauren Slive. The mission of MedPLUS Connect is to connect underserved health systems in developing countries with recovered and donated medical supplies from U.S. hospitals and manufacturers. The value MedPLUS Connect creates is most dramatically exhibited in the additional lives that can be saved by increasing access to medical supplies and equipment for hospitals in developing countries. MedPLUS Connect is a 501(c)(3) non-profit organization. The mission of MedPLUS Connect is to connect underserved health systems in developing countries with recovered and donated medical supplies from U.S. hospitals and manufacturers. MedPLUS Connect empowers health personnel in developing countries to select medical supplies that are compatible with local resources and needs, and to fund shipments of these supplies in a sustainable, predictable and reliable manner. The current focus of MedPLUS Connect is northern Ghana, West Africa. As a novel, demand-driven social venture, MedPLUS Connect addresses several key needs. Hospitals in the United States pay waste management companies to dispose of usable medical supplies. Currently, United States hospitals spend over $700 million USD annually to dispose of over $6 billion USD worth of medical supplies, many of which are recoverable and reusable. Since patients are often billed for all consumable supplies that enter their hospital room, enormous quantities of clean, unused, and unopened supplies must be disposed of or donated. Hospitals also donate high value medical equipment, such as x-ray and anesthesia machines, when they upgrade their working equipment to a newer model. MedPLUS Connect partners with hospitals and health centers in Ghana to create a direct link between recovered supplies from the United States and under-resourced health care systems in Ghana. Before sending medical supplies, the MedPLUS Connect team conducts one or more site visits at each hospital or health center to meet with physicians and administrators, tour the facilities, and discuss the specific needs of the facility. We work directly with hospitals officials to develop a prioritized request list that details the specific equipment and supplies that the hospitals needs most. This ensures that our shipments of medical supplies are compatible with the needs, resources and technologies of our partner hospitals in Ghana. After receiving a request list, we work with our partners in the United States, including hospitals, non-profit supply recovery warehouses and medical manufacturers to fill the needs of our partner hospitals. MedPLUS Connect is able to provide non-drug consumables and medical equipment, as well as hospital furnishings and hospital beds. Medical machines and hospitals beds may have been used previously in United States hospitals, but all consumable medical supplies are clean, packaged, unused, and unopened. Although we cannot guarantee that we will have access to any particular machine or item at a given time, we do our very best to fill our shipments with high-quality and high-value supplies from a hospital's request list and have been very successful in doing this in the past. All supplies and equipment that MedPLUS Connect provides are donated by hospitals, non-profit organizations, and manufacturers in the United States. 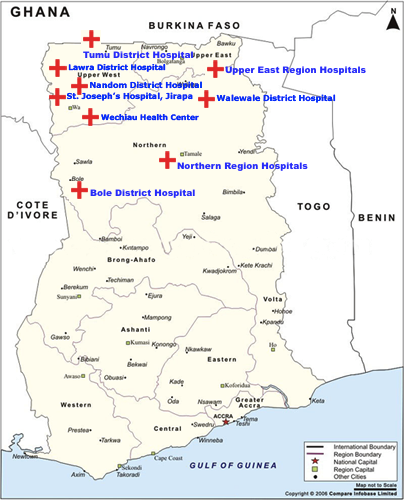 However, we charge recipient health institutions in Ghana the cost of storing the supplies in warehouses in the United States, shipping and trucking from the United States to the destination in Ghana, and a surcharge that allows us to purchase electrical compatibility equipment for medical machines, conduct site visits in Ghana, and remain a sustainable organization. Funding shortages are a significant issue for many of our partner hospitals so we also work with the Ghana Ministry of Health to help cover the costs associated with each shipment. By partnering with MedPLUS Connect, our Ghanaian partner hospitals are able to save a large portion of their budgets that they would otherwise spend on non-drug consumables. Hospitals are able to divert these saved funds toward child and maternal health programs, outreach initiatives, and hospital expansion. In addition, MedPLUS Connect ships high-value items such as vitals monitors, suction machines, EKGs and hospital beds, giving hospitals unique access to expensive, high-quality items that they could not ordinarily afford. The MedPLUS Connect team is dedicated to partnering with local health and government officials to improve the provision of quality health care in the most impoverished and underserved areas of Ghana. Where do the supplies MedPLUS Connect ships come from? Are the medical supplies and equipment new or used? How does MedPLUS Connect know what to send hospitals? How does MedPLUS Connect deal with differences in voltage and plug types? What is the relationship between MedPLUS Connect and Project Heal? How can I volunteer my time or get an internship with MedPLUS Connect? MedPLUS Connect only sends new, unused, unopened consumable supplies. (such as gloves, sutures and gauze) However, MedPLUS Connect does send used equipment, provided the equipment is in good working order (equipment such as x-ray machines, autoclave, beds and computers). MedPLUS Connect works directly with partner hospitals and health centers. Our partners in Ghana submit full request lists and we aim to fill shipments with items from the list, according to the order of priority given in each list. Thus, we ensure that we only send hospitals items they can and will use. MedPLUS Connect includes step down voltage converters and adapters when such items are necessary. Project Heal is a service organization based at the University of North Carolina at Chapel Hill. Two of MedPLUS Connect's founders, Emma Lawrence and Lauren Slive, founded Project Heal in 2006 to provide service opportunities in Ghana for undergraduate students at UNC Chapel Hill. As part of their service projects, Project Heal volunteers began bringing basic medical first aid items to Ghana and to Lawra District Hospital, culminating in the shipment of a number of supplies in pallets in 2008. This inspired the creation of MedPLUS Connect, which was founded to focus directly on connecting hospitals in need in Ghana with available donated medical supplies in the U.S.
MedPLUS Connect Featured in Carolina Alumni Review! Upper East Regional Shipment Distributed! MedPLUS Connect Becomes New Partner on Global Giving!